We went in to Maryville with Heather and the aunts to get some steamed sandwiches and run some errands before heading over to the Great Smoky Mountains National Park to do the Roaring Fork trail with Reese. We were hoping that there was going to be some water flowing thanks to the storms last night. It wasn’t as much as I was hoping, but it was still good. Reese is getting comfortable with the new camera and got some good pictures. 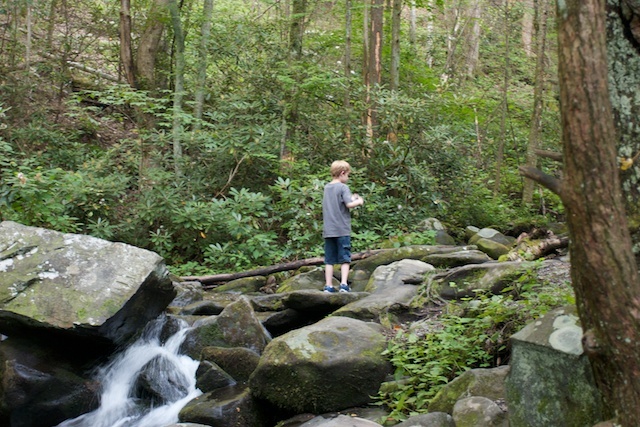 We hiked over a bunch of rocks to get to some good picture taking spots as well as some of the easier stopping points. After we got back we had some dinner and then sang happy birthday and had some birthday cake and ice cream. This entry was posted in Personal, Photography, Travel by Pat. Bookmark the permalink. Awesome Birthday Present! More pics pleeze. So now that you’ve gradgee-ated and all, you gonna make Dallas Area Blogshoot II? Well Congratulations! Belle sends her best wishes as well. Looks like Sunday Sept. 16 is going to be the date for the blogshoot. Sounds like a plan! I’m going to be there, and it looks like Heather will as well. We’re looking forward to it!